At Cannes International Boat Show, Beneteau unveiled its very innovative sailboat, the Beneteau Oceanis 38, a new yacht offering a revolutionary concept. Under three versions, Oceanis 38 adapts to three worlds and evolves to match the yachtsmen needs, desires, and lifestyle at sea. DAYSAILER, WEEKENDER, CRUISER… a same yacht served by a concept allowing yachtsmen to enjoy different stages in their boating life and cruising at everyone’s pace on seas the world over. With Oceanis 38, all sailing dreams can come true, whether your desire is to sail single-handed, as a couple, with family or friends. She has been conceived to give the owner the choice of layout, a layout designed to evolve and adapt to stages in life through the addition and subtraction of elements. In its initial DAYSAILER layout, for people who only sail for a few hours, the Beneteau Oceanis 38 is designed like a loft at sea. Inside, the comfortable companionway opens onto a single area in which bulkheads have been removed, providing a striking feeling of space. The fittings are reduced to essential needs. The view to the bow is unobstructed, revealing large sofas and a deliberately minimalist galley. 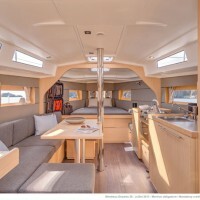 The rear of the yacht is dedicated to storage and the cockpit is uncluttered. 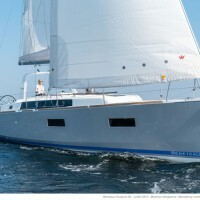 The next step is the Oceanis 38 WEEKENDER, for a few days cruising. She offers a choice between 2 layouts (2 or 3 cabins to be fitted out) the customer can configure as he wishes: open or closed cabins, separate shower cubicle, fitted galley, extra table inside/out, helm seats, etc. to create his own boat. 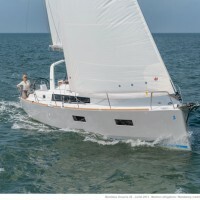 To put out to sea on a few weeks, the CRUISER is more conventional, in the tradition of the Beneteau Oceanis line. The interior can boast 2 or 3 fitted cabins, a large galley facing the saloon seating 6 people, and a shower room with separate shower. 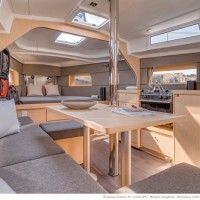 But this original and more traditional layout can also evolve, since the bulkheads of the fore cabin can be removed to give it a loft-like atmosphere. The outside fittings are comprehensive, since among other things, it has the mainsail arch, helm seats, and bathing platform. Another clever innovation, this Oceanis is designed to welcome on board a set of luggage designed exclusively for Beneteau by Philippe Cassegrain, President of Longchamp. The “Rolling Locker” welcomes all necessary accessories for easy storage and life on board. In the boat, it takes place in a dedicated cabin space and instantly unfolds, turning into a wardrobe.